Hermetic Library Fellow T Polyphilus reviews The Cassini Division by Ken MacLeod. In many ways, the plot of Ken MacLeod’s third “Fall Revolution” novel is like that of a Star Wars movie: it features a protagonist with a painful family history seeking out and recruiting a necessary sage, a further “side quest” that turns out to be integral to the resolution of the main challenge, and a climactic space battle. Even the fact that the main character is a black woman doesn’t much distinguish it from the latter-day Star Wars pictures, with their increasingly diverse central cast. What really sets it apart is a genuinely speculative sensibility, as contrasted with the reactionary space fantasy of the Forced films. Replacing the Rebel Alliance with a Cassini Division who protect the anarcho-socialist Solar Union against a post-human presence on Jupiter makes for a very different story. MacLeod’s socialist heroes subscribe to what they call “the true knowledge,” which is identified–by a “non-cooperative” character who doesn’t accept it–with Aleister Crowley’s Law of Thelema (albeit with surplus capitalization, 86). Nor has MacLeod abandoned the complementary anarcho-capitalist setting he has developed on New Mars, at the far side of the wormhole gate created by the ancestors of the Jovians. 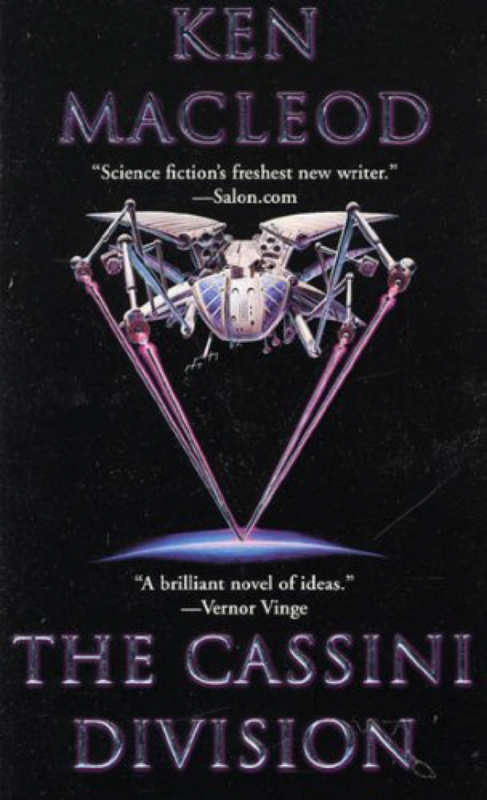 The theme of disputes over personhood for post-human individuals is carried forward in this book, but where it centered on the notion of slavery in The Stone Canal, it is tied more directly to the issue of genocide in The Cassini Division (as in the first book of the series, The Star Fraction). This book is clearly part of the vanguard of a species of post-cyberpunk space opera for which MacLeod is one of the best representatives. The chief protagonist is Ellen May Ngewthu, and she is the first-person narrator throughout the book. Ellen is an interesting character, and not a profoundly reliable narrator. McLeod does not offer a documentary rationale for her role as the book’s speaker as he has for points-of-view in other novels. It’s just a narrative convention, and part of the fast-reading package. Despite the surfeit of new ideas in this book, they build cleanly on the previous volumes, and I read the whole thing with pleasure in a little over two days. This entry was posted in Hermetic Library Reading Room and tagged book, Ken MacLeod, review, T Polyphilus on September 11, 2018 by John Griogair Bell.